Amazon is launching the Fire TV set-top box in the US, for access to Netflix, Prime Instant Video, Hulu Plus, WatchESPN, Showtime, low-cost video rentals, and access to locally stored content. The box is available for retail at $99 (€72) and connects to a TV set with a HDMI cable. The box works with apps, which make access possible to not just Amazon’s own Instant Video and Prime Instant Video services, but also Netflix, Hulu Plus and many more. 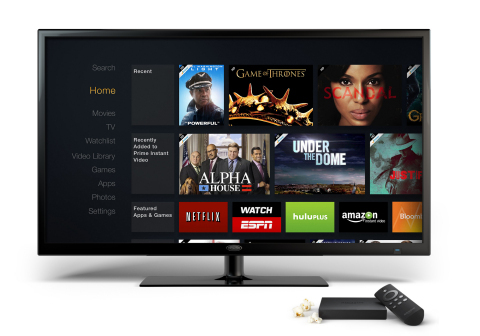 App developer Plex was also quick to announce its availability on the new Fire TV box. It also connects to Amazon Cloud Drive. Music streaming is available from Amazon MP3, Pandora, iHeartRadio, TuneIn, and more. Apps and games built for Android are compatible with Fire TV. “Tiny box, huge specs, tons of content, incredible price—people are going to love Fire TV,” said Jeff Bezos, Amazon.com founder and CEO. Gaming is also a feature of the box with Minecraft, Monsters University, The Game of Life, The Walking Dead, NBA2K14, Asphalt 8, Riptide GP2, Despicable Me: Minion Rush, and more. The average price of paid games on Fire TV is $1.85. Play using the Fire TV remote, the Fire TV app for smartphones and tablets, or the optional Fire game controller. The company did not disclose any details about future launches outside the US.